EMAG is the global market leader for vertical pick-up turning machines. the high productivity of EMAG CNC machines. The modular VL pick-up turning machines are space-saving vertical turning centers with an integrated automation system. Maximize performance and achieve the lowest possible unit cost with these turning machines. 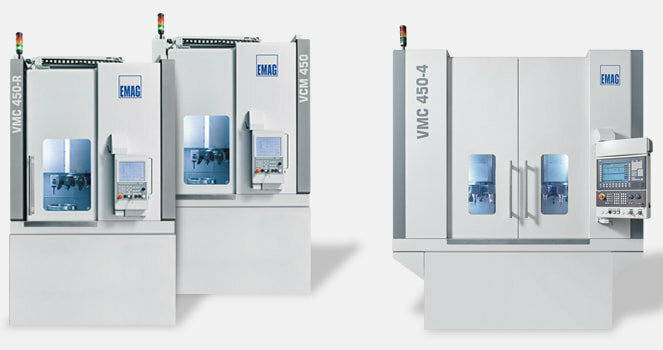 Available in a variety of versions, the VL series vertical turning centers allow for the production of workpieces ranging from 10 mm to 400 mm (0.4 in to 16 in) in diameter. With its pick-up working spindle, the automation system is very responsive when it comes to traversing along the X and Z-axes and the tool turret guarantees short indexing times. To machine complex geometries, these CNC lathes can also be equipped with a Y-axis in the turret. The VL 3 DUO CNC turning center extends this product range even further with a twin-spindle machine solution for chucked parts up to 150 mm (6 in) in diameter. Each turning centers machining area includes a 12 tool turret. Driven or turning tools can be loaded on these turrets. A TrackMotion automation system links the vertical turning centers in a VL DUO Line. The vertical turning machine and automation system both use a Fanuc or Siemens control unit. The modular VL CNC turning centers are space-saving vertical turning centers with an integrated automation system. The VLC series CNC turning centers offer a broad range of technology modules. 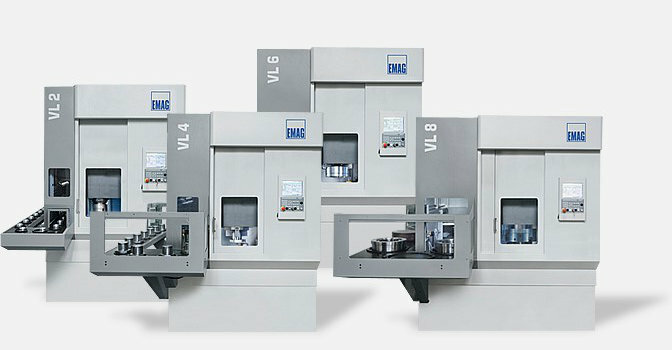 The VLC series CNC turning centers offer a wide range of technology modules, and can be customized for specific machining requirements. Turning tools, milling spindles, as well as, multi-spindle drill head modules are available. The VLC 100 GT combination machine turns and grinds chucked components. Designed with pick-up automation, this CNC machine can be equipped with a grinding spindle and a fixed block tool holder. The VLC 500, VLC 800 and VLC 1200 multifunctional production centers are perfect for maximizing performance and the complete machining of large workpieces with a maximum diameter of 1,200 mm (47 in). Additionally, this CNC lathes integrated technology allows for complete production in one clamping operation: soft and hard machining, interrupted cut, turning, drilling, milling, grinding, etc. Precise heavy-duty machining. The vertical turning centers of the VM (standard) or VMC (customized) series were developed for high-productivity machining of workpiece families with a wide variety of parts. The CNC turning center features a tool turret with 12 tool positions. These positions can be loaded with driven tools to perform things such as drilling operations. Additionally, an integrated measuring probe ensures process reliability and guarantees the consistently high quality of workpieces. VM/VMC series machines are ideal production systems for large and heavy chucked parts with complex geometries. Every CNC machine in the VSC series is a manufacturing cell, since the machine is self-loading thanks to its pick-up spindle. Every CNC machine in the VSC series is a complete manufacturing cell, with the ability to self-load due to the integrated pick-up spindle. The ability to customize the machine tool to fit a variety of production requirements is one of the primary benefits of the VSC series. Turning, drilling, grinding, milling, gear cutting, as well as honing – can be performed on just one machine tool. Additionally, we are able to maintain our high quality standards by using a measuring probe, integrated into the lathe. This probe provides quick and accurate measurements of the workpiece, without any extra effort. Maximize productivity in the production of chucked parts with these vertical multi-spindle CNC lathes! These CNC turning centers are primarily used for medium to high-volume production of precise workpieces. The vertical multi-spindle machines stand for high-productivity machining of chucked parts. Four-axes, short travel distances and a powerful main spindle – these are the strengths of the VT seriesCNC turning centers, designed for workpieces with a maximum diameter of 200 mm (8 in). When required to produce high part volumes, the benefits of this machine platform are obvious! By machining the workpiece from two sides, more parts can be machined, quicker on this platform - as a result, production times are dramatically reduced. Turning traditional manufacturing on its head! The VTC series was designed for the vertical machining of shafts of up to 200 mm (8 in) in diameter. Users of these turning centers benefit from minimized throughput times, safe processes as well as high precision. The VTC machines use production modules to adapt to specific machining requirements. The VTC series is specifically designed for vertical machining of shafts of up to 200 mm in diameter.